And you can purchase the potty training kit when you click here for the BabySigns, Inc, site. Floating Swimwear make float wear products for babies, toddlers and children that are designed with water safety in mind. The built-in puncture proof flotation will give parents peace of mind when their kids are in the swimming pool but of course it doesn’t eliminate the need to supervise children near water. This deluxe 2 in 1 swim suit is made from a light-weight and flexible material and comes in an attractive lime color with stripes that can be worn by girls and boys alike. It comes with an attachable floatation vest that consists of soft and flexible foam. It can easily be taken off when playing out of the water due to the durable snapping locks on each side of the swim suit. The suit is very comfortable to wear both in and out of the water and comes in various sizes, XS – Age 2 to 4, S – Age 4 to 6 and M – Age 6 to 8. Enjoy the many benefits of this swim suit, especially the safety aspect in and around water. For more information on this great product, go to www.Sportskids.com. Nursing Your Baby? What If You Have To Go Away? It is possible that as a new mom, there will be times when you will have to be away from your baby for a short period of time. Perhaps you have to travel on business, or there is a medical procedure that you must have, that will make it impossible for you to breastfeed for awhile. This doesn’t have to mean weaning, however. If you are a nursing mom, there are some extra steps you can take to ensure you and your baby cope well with this change in schedule. This means stocking up on milk to nourish your baby while you’re away, keeping up your milk supply and remembering a few comfort techniques for yourself. Here are a few tips for nursing moms who have to be away from their baby. Depending on how long you’ll be gone, you’ll want to begin pumping extra milk daily to be stored and used to feed your baby while you’re on your trip. This might take a couple of weeks, depending on how much your baby eats, how often you pump and what your milk supply looks like. Store your milk in freezer-safe containers that the babysitter or another family member can pull out and warm for baby when he or she is hungry. 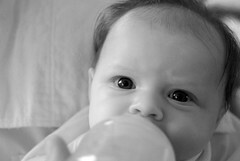 If your baby is not used to bottle feeding, it might be a good idea to briefly introduce the bottle to him or her before leaving. It usually works best if someone else offers the bottle, not you, as baby will often reject a bottle when your breasts are nearby. You can also leave behind an article of clothing of yours, such as a shirt or nightgown, to remind baby of your smell while feeding. While away, it is important to keep up your milk supply if you plan on nursing your baby when you get back. To do this, you’ll need to find a pump that works well for you. It may be a hand pump, electric pump or by hand expressing your milk. You’ll want to pump as often as your baby usually nurses, if possible. The pumping will cause your body to believe it is still nursing and continue to produce milk on a regular basis. Many women find it helpful to take along a picture of their baby to look at while pumping or a blanket that has their smell. It is a good idea to use the same blanket during a couple of feedings before leaving and take this with you. You might want to wear nursing pads throughout the day to catch any leaking that may occur. Not being able to nurse as frequently can cause painful engorgement for some women. The breasts feel sore, tender and hard in some areas. Pumping the milk out can help out tremendously, but you may still want to employ some comfort techniques for your own benefit. Take a warm compress, such as a hand towel moist with warm water and place on your breasts. After a few minutes of direct heat, take some natural oil, such as sweet almond oil and gently massage the lumps in your breasts. This will help the milk flow easier and is a good time to pump some milk out. After massaging the breasts, a cold pack might help reduce discomfort and pain. A hot or cold shower can replace the hot or cold packs if you wish. just because you’re breastfeeding doesn’t mean you can’t be hot!